For each course with published grades, you may click the grade in the Academics section to see recently published scores and any zeros. These details slide open for you to view them. Click again and the details window closes. 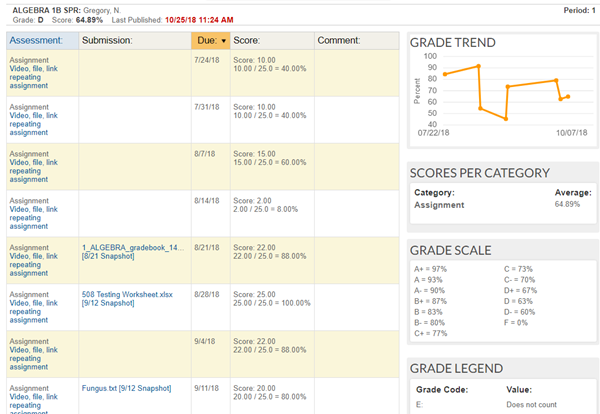 Use the "Progress Report" link to view the full details of assignments, scores, comments, grade scale, etc. 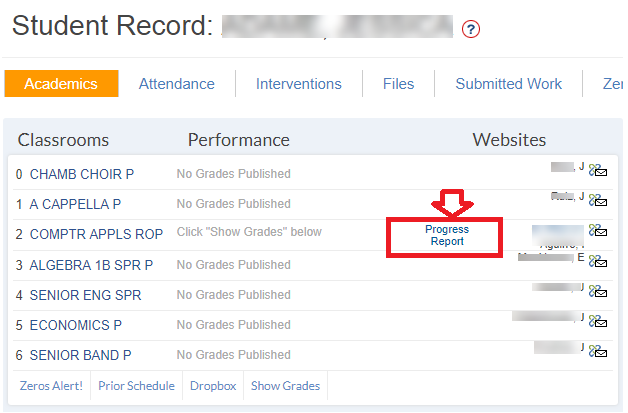 The Progress Report is a snapshot of all published grades in a teacher's gradebook. 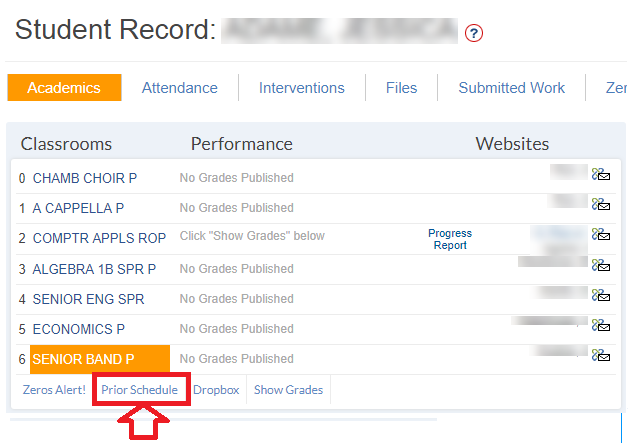 Progress Reports are updated each time a teacher publishes their gradebook. You can access your Progress Reports from your Portal in the Academics section only if your school has chosen to make them public and if your account has been approved to view grades according to your school's policies. Please Note: Progress Reports are not official report cards nor do they become part of a student's official transcript. Choose the report you wish to view and click Go. 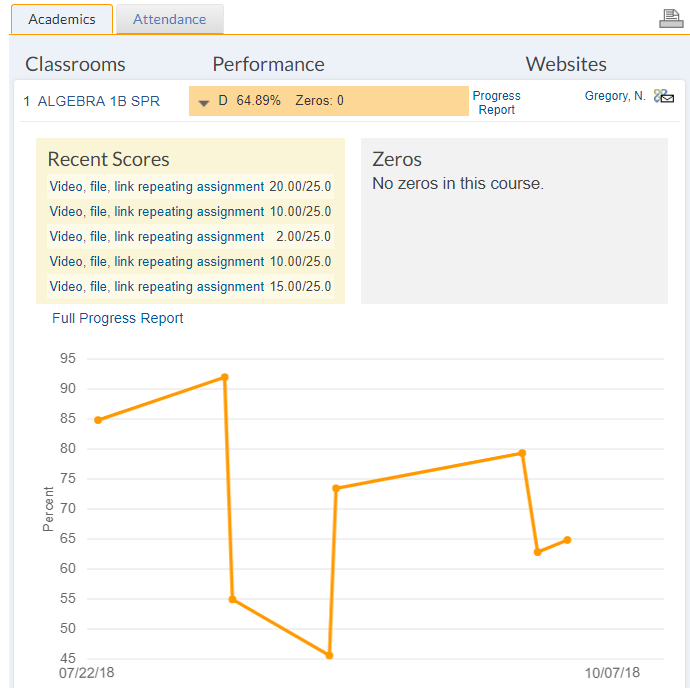 You can see the last published Progress Report for courses you are no longer enrolled in by clicking the Prior Schedule button located in your Portal Page just under the Academics section. Click the Grade link for the course Progress Report you wish to see. The rows of the progress report by default are sorted by due dates. You may choose to sort by assessment title by clicking the label at the top of the column. The grade scale posted on the progress report is set by each teacher and/or school. 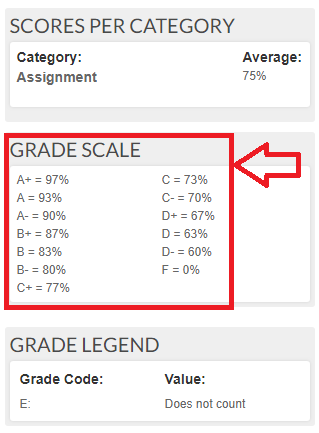 The scale shows what percentage a student must earn in order to receive a particular letter grade. Each course Grade Scale is located at the bottom right-hand side of each progress report. To get more information about a particular assignment click on the name of the assignment from the Progress Report. All assignment names are links to a View Assignment page. Where ever assignments are listed on your portal homepage and in your calendars, the title always links to the full details.